This is the case for FAT and FAT32, here you can't change the time when the entry last access Windows files! On the FAT file system, is the access date modifiable but not the last access time! (Image-1) Windows files it does not change the last access time on FAT! (Image-1) You can change on the NTFS the last access time for Windows files! 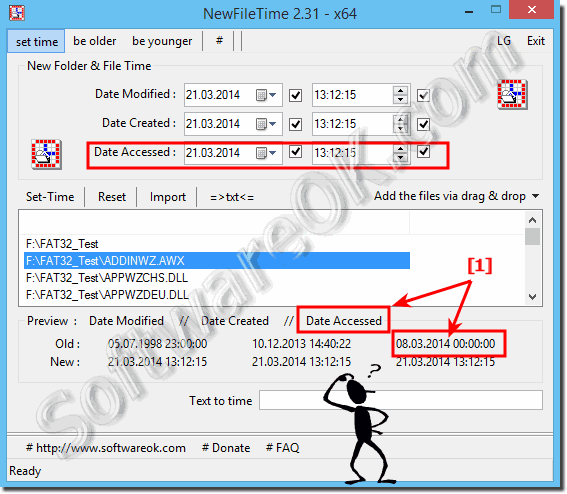 NewFileTime - FAQ-2: Windows files can't change the last access time hour and minutes? I have an external hard drive (Portable) FAT32. So far, I have only operated these under Windows 10 and Windows 7. Why can not I change the file time for the Last Access entry. Is this a bug in the program or did I do something wrong, on the local hard disk c: \ of Win-10 it is easy to change the time in the entry "last access" can.? In my case I would have to change "Last access on ...", I have set a check mark and it has already been changed for each file when it was last accessed by date everything OK. This nice feature is good but the time does not change, why? I had the suspicion that some private files on my PC are opened by unauthorized persons. Did you want to change the last file time using NewFileTime but the time is not changed, what am I doing wrong?